The pancreas resides in the back of the abdomen. It functions to produce digestive enzymes which are delivered to the small intestine (duodenum) and various hormones, which are delivered to the bloodstream. One of the most important hormones produced by the pancreas is insulin. 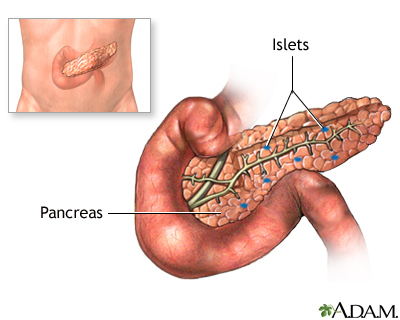 Insulin is produced by specialized cells of the pancreas called islets of Langerhans. Insulin regulates blood sugar levels.